Six players return from the Indians 2017 roster that won the second half NWL North Division Championship. The returners include standout pitcher Tai Tiedemann (4-4, 3.43 ERA), starting centerfielder Miguel Aparicio (.293, 33 RBI, 47 runs), NWL home run leader Curtis Terry (.258, 12 HR, 30 RBI), starting shortstop Cristian Inoa (.213, 4 HR, 31 RBI), plus experienced infielder Jonah McReynolds and catcher Isaias Quiroz . Former Gonzaga Bulldog Royce Bolinger returns to Spokane after six years in the Rangers organization. Bolinger is being converted from outfielder to pitcher, with his first step back in Spokane. In 2012, he hit .301with 26 RBI as an Indian. Six players on the 2018 roster were selected by the Texas Rangers in the 2017 MLB Draft. That includes three notable young pitchers in right-hander Hans Crouse (2ndround), right-hander Ryan Dease (4th round), and left-hander Jake Latz (5th round). Crouse is currently rated as the Rangers' #4 prospect according to MLB.com. He struck out 30 batters in just 20 innings pitched last season in the Arizona League. A complete list of the current roster can be viewed here. The Indians are expecting to receive players from the 2018 MLB Draft, although their arrival time is still to be determined. Last season, Spokane received seven players from the 2017 draft, with only one of the seven coming from high school. In this year's draft, 27 of the Rangers' 40 picks were pitchers, 23 of which were right-handers. With the remaining picks, Texas selected six shortstops, three catchers, three outfielders, and one third baseman. The Rangers selected five high school players with their first five picks. Most notably, right-hander Cole Winn was picked by Texas in the first round pick (15th overall). Winn sports a 94 mile per hour fastball and was named Colorado's Gatorade Player of the Year as a junior in 2017. Some draft experts had Winn listed as a top five prospect in the entire draft. 25 of the Rangers' 40 picks were college players, including right-handers Sean Chandler (6th round) out of Iowa Western Community College and Tim Brennan (7thround) from St. Joseph's University. Their first collegiate position player was Arkansas Razorback shortstop Jax Biggers (8th round). 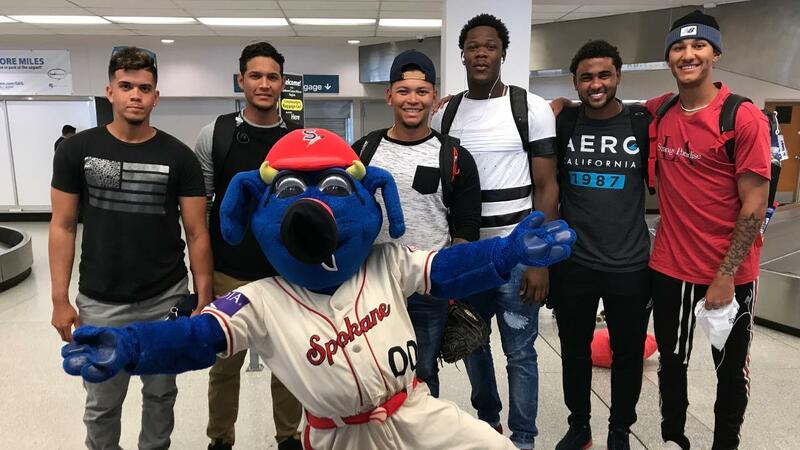 Fans will have their first chance to meet the 2018 Spokane Indians for the Player Welcome Party at the MAX at Mirabeau Park on Monday, June 11th from 5:30 PM - 7:30 PM. Fans can come enjoy special prices on food, grab autographs from Indians players, and get pumped for another exciting year of Spokane Indians baseball. On Wednesday Avista Stadium will be hosting FanFest which will include a LEO's Photography Autograph Session, player introductions, and a Home Run Derby courtesy of Avista. At the end of the event all kids are welcome onto the field to Circle the Bases courtesy of Dairy Queen, and all fans will receive a 2018 Season Poster courtesy of Pizza Factory. The Indians open the season against the Boise Hawks on Friday, June 15th for Opening Night Fireworks & AAA Magnet Schedule Giveaway presented by ABC Office Equipment, KREM 2-TV, 93.7 The Mountain, 1510 KGA NW Sports Talk, and The Journal of Business. The Spokane Indians are the Short Season Class "A" affiliate for the Texas Rangers. Avista Stadium is home to the $5 Bench Seat courtesy of Multicare. Ticket packages for the 2018 season are now available for purchase. CLICK HERE to reserve your seats today. Parking at all Spokane Indians games is FREE. The Spokane Indians Team Store is open M-F 9:00 AM - 5:00 PM, and 10:00 AM on all game days.